A Forceps Jar is a wide-mouthed container, usually cylindrical, for storing Forceps, Scissors, Scalpels, etc. GPC Medical Limited, the internationally renowned manufacturers & exporters of a wide range of hospital equipment and devices, produce a premium range of stainless steel hollowware including Forceps Jars. 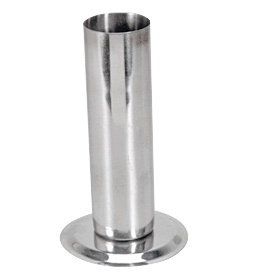 Meeting the exacting requirements of the healthcare industry, we use high grade stainless steel for the production of these jars, the base of which is wide and heavy so that there is no tipping while putting in or removing the instruments. Our Forceps Jars, made of heavy gauge stainless steel, are seamless, eliminating the possibility of certain areas which can harbour bacteria. They are non-corrosive, chemical resistant and durable. They can be autoclaved. They are suitable for hospitals, nursing homes and doctors' offices. In addition to our regular sizes, they are also produced in different dimensions as per the customized requirements. The GPC Stainless Steel Forceps Jars are widely used in healthcare facilities in many different countries. Send Your Buy Requirement For "Forceps Jar" AND Get Quote Quickly.